Editor’s Note: This week, Ziad Tamim will show you how to fetch and parse JSON. 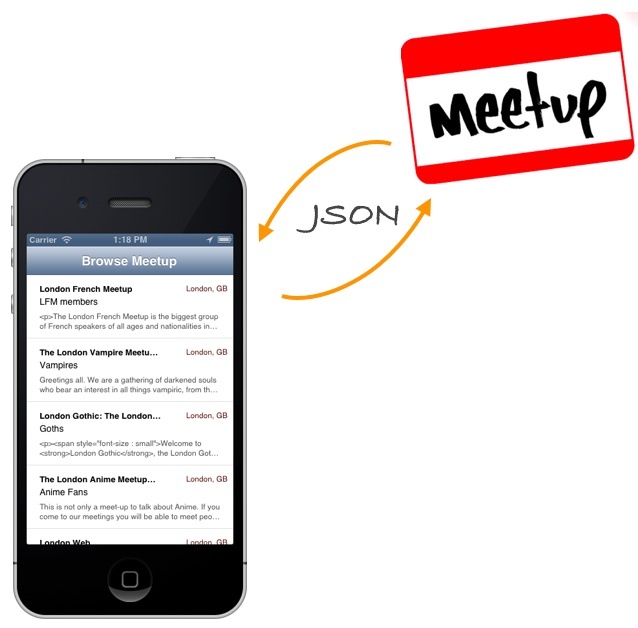 In this tutorial, we will be focusing on adding JSON support to your iOS apps by demonstrating how to create a simple app using Meetup API. The tutorial may be a bit complicated than other tutorials we covered before. You’re expected to have basic knowledge of JSON and design patterns. Enter the JSON programming tutorial. As you can see, the JSON data is human-readable and easier to parse than XML. If you still have no idea about JSON, check out JSON Guide to learn more about it. Since the release of iOS 5, the iOS SDK makes it easy to fetch and parse JSON data. In this tutorial, we’ll demonstrate how to use the built-in API to query a JSON-based API from Meetup and deal with the returned data appropriately. Before we move onto the code, let’s take a look at what we’ll build. In this tutorial, we’ll create a simple app called BrowseMeetup that consumes Meetup’s public API. If you haven’t heard of Meetup, it is the world’s largest network of local groups. You’re free to use Meetup to organize a local group or find one of the thousands already meeting up face-to-face. Like other social networks, it provides open API for accessing its data from your own apps. 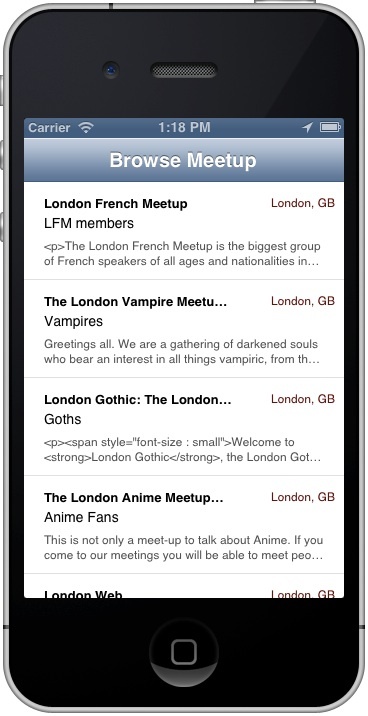 The BrowseMeetup app will consume the web service of Meetup to look up for groups nearby. The app will get the current location and then automatically load the nearby Meetup groups. Note: This app utilizes Core Location framework. If you don’t have any idea about it, check out our tutorial about How To Get the User Location in iPhone App. The focus of this tutorial is on JSON fetching and parsing. So to save your time from setting up the project, you can download this project template to start with. The template already pre-built the user interface and implemented the Core Location for you. Tip: If you have no idea about table view and wonder how the navigation bar works, check out our tutorials in the free iOS course. 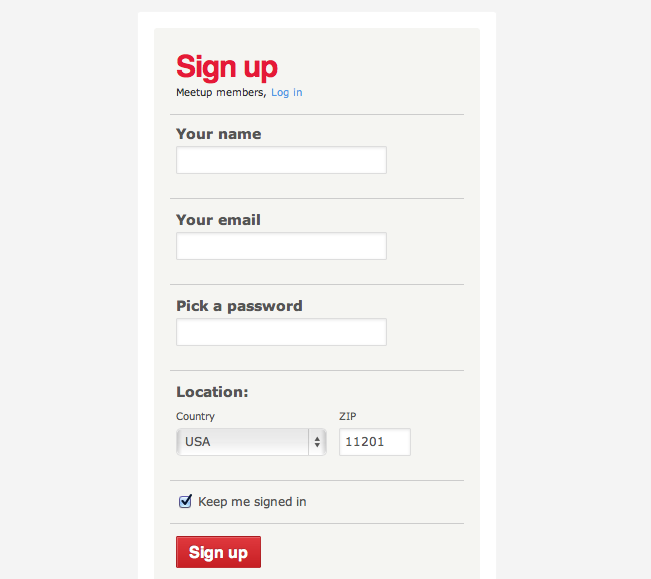 Before you can use Meetup APIs, first create a new account on Meetup. Start by creating a new account by going to APIs Doc and clicking on the button “Request to join this Meetup group”, then fill the necessary information and hit “Sign Up”, then go step by step until its done. We’ll use one of the Meetup APIs (i.e. https://api.meetup.com/2/groups) for fetching the Meetup groups held at a certain location. The call allows developers to specify the location by using latitude and longitude. You can test the call by using the API console. "description": "The London French Meetup is the biggest group of French speakers of all ages and nationalities in London. We hold regular events to meet up, talk in French and share interests in French culture whilst having a good time. We have two main events per month where we have the whole of the upstairs of a pub. The organising team is made of volunteers from different nationalities and ages. Our members are made up of: 1/3 French nationals, 1/3 British nationals and 1/3 other nationalities and francophone countries. If you have any ideas or suggestions for events or would like to help please let us know. It may be a bit complicated for some of you. But let me give you a brief walkthrough. We create a MeetupManager, in which it will request for Meetup groups for a particular location. Here the MeetupManager acts as a facade. If you haven’t heard of the Facade design pattern, you can think of it as a coordinator of other classes. The Facade tries to provide a simplified interface for the view controller and shields it from the underlying implementation. The MeetupCommunicator class is used for communicating with the Meetup API. Once Meetup responds with the JSON-formatted response, we’ll pass it to GroupBuilder that constructs the Group object. The MasterViewController uses Core Location to figure out the current location and informs the MeetupManager to get the Meetup groups for that location. The MeetupManager coordinates with other classes to retrieve the groups. Once the groups are retrieved, it communicates with the MasterViewController via the delegate and pass the groups found. 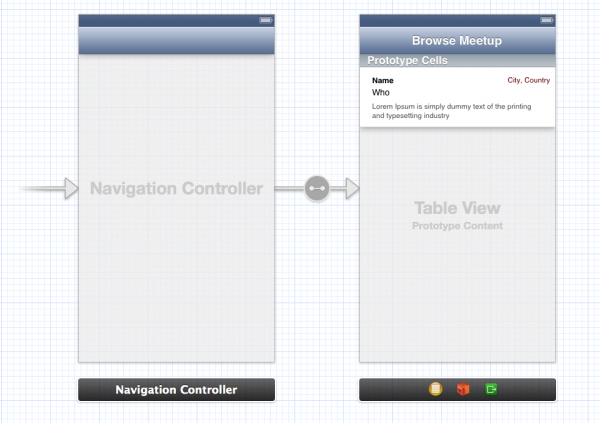 The MasterViewController then presents the groups in the table view. These properties are the information that we will use in our app to achieve the final result depicted earlier. The MeetupCommunicator class is responsible for the communication with the Meetup APIs and fetching the JSON data. It relies on the delegate of MeetupCommunicatorDelegate to handle the parsing of JSON data. The communicator has no idea how the JSON data is handled. Its focus is only on creating connection to the Meetup APIs and fetching the raw JSON result. The Meetup API needs a key to work. If you’re registered an account, you need to get one by going to API Key page. Simply click on the lock icon beside the textfield to reveal the key. Copy the text inside it and replace the value of the macro API_KEY with your own API key. In the implementation of the method, we first construct the Meetup API URL with the specified latitude, longitude, the number of groups and the API key. In order not to blocking the UI, we load the data for a URL request asynchronously by using the “sendAsynchronousRequest:” method of NSURLConnection. Finally, when the JSON data is retrieved, it passes the data to the delegate for further processing. The “groupsFromJSON:” method is designed to convert raw JSON data into an array of Group objects. Since the release of iOS 5, the iOS SDK comes with a class called NSJSONSerialization for parsing JSON data. Developers can use the class to convert JSON to Foundation objects or convert Foundation objects back to JSON. When reading JSON data using NSJSONSerialization, all the keyed lists are automatically turned into NSDictionary objects. For array, it’s converted into NSArray instances. Any strings encountered along with the names of named items in keyed lists are converted into NSString, while purely numeric strings are converted into NSNumber objects. Lastly, any values of null are represented using NSNull. Referring the sample response we showed you in earlier section, the Meetup API returns a JSON response with two main parts – results and meta. We’ll just need the “results” part. The code is very straightforward. We loop through the results and look into each NSDictionary inside it. We then create a Group object and fill it with the necessary information, then adding it to the mutable array. Now you should know how to work with JSON, parse the data and convert it into objects. Next, we’ll implement the MeetupManager which serves as a coordinator of the underlying classes. This delegate declares two methods and will be called by MeetupManager when the groups become available. The first method is called when the list of groups retrieved from Meetup is parsed, while the second method is invoked when an error occurred. The MeetupManagerDelegate will be implemented by MasterViewController that we’ll discuss in later section. As said, the MeetupManager acts as a façade. The app’s controller can work with the model object (i.e. Group) created without knowing any details about the network connection, JSON fetching/parsing or how the group objects are created. What the controller just needs to know is to use the “fetchGroupsAtCoordinate:” method for fetching Meetup groups. We set up a property to keep an instance of our communicator which we will cover later and the other to keep track of the MeetupManagerDelegate. The “fetchGroupsAtCoordinate:” method will be used by the controller to fetch groups. Here we implement the method fetchGroupsAtCoordinate:coordinate to fetch the groups in a certain area using the searchGroupsAtCoordinate:coordinate method of the communicator. We also implement the methods of MeetupCommunicatorDelegate for handling the JSON-formatted results as retrieved by the communicator. The code inside the first method of the protocol receivedGroupsJSON:objectNotation uses the class method of GroupBuilder to convert the JSON result into Group objects and then informs its delegate with the Group objects. If there is any problem while processing the request, we invoke the other method (i.e. fetchingGroupsFailedWithError:) of the delegate to notify the controller that a problem is occurred. We are instantiating a new manager, then fill its communicator property with an new instance, and finally making the current view controller to keep track of any changes. The observer here captures the response of the user when the alert shows up to enable location services to call the method startFetchingGroups: to start fetching groups from server. The “didReceiveGroups:” method will be called when the Meetup groups is grabbed from the Meetup server with an array instance returned. Here we simply reload the table view to display the new data. The above code is very straightforward. We retrieve the groups from the array and fill the table cell with the group information. Tip: If you have no idea about testing location in iPhone Simulator, check out the Core Location tutorial. We have covered in this tutorial many aspects of programming by adopting the right design pattern to work with JSON data. You should now have a hands-on experience on fetching and parsing JSON data. The tutorial may be a bit difficult if you’re new to design pattern. However, this shouldn’t scare you away from using JSON in your app. 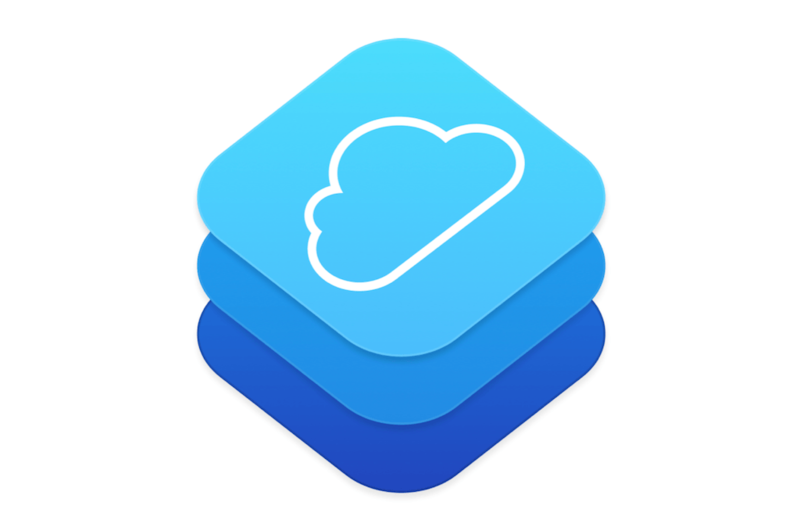 The iOS SDK makes it so easy for your apps to work with JSON. In summary, you simply create a URL connection, fetch the JSON data and parse it by using the built-in NSJSONSerialization class. You can find various free APIs (such as Kiva and TMDb) on the Internet. As an exercise, try to pick another API and develop another app for it. Say, you can develop a simple app and display a list of the most recent fundraising loans using Kiva API. For your complete reference, you can download the full source code of the Xcode project here. As always, please leave us comment and share your thought about the tutorial. It works well, but rendering tableView takes so long. Is there any way to make rendering table view faster? You can add a spinner to table view while data is loading, this way the user knows some work is going on. Very nice tutorial. I love to come here and learn new stuff and more importantly, your clear and efficient design patterns. One thing: the data is loaded but it is not displayed on the table view until you scroll it. Any ideas how to fix it or on which part of the code you must put [tableview reloadData]. Based on the example, this should go in didReceiveGroups method of the master controller. Thanks a lot for a great tutorial! I actually didn’t follow verbatim…I just needed to get the concept of how to interact with JSON APIs, so I could apply it to my own app, and this tutorial was a massive help. Can’t thank you enough for how easy you made the process for me. Keep up the great work you are doing! Obviously an app like this won’t work without the internet. Is there an easy way to display to the user that “hey, you need a network connection to run this app”? Thanks for a great tutorial! Thanks very, very much! Everything I found regarding iOS and JSON was related to old, non-native libraries. This is the best one I could find using native code! ridiculously overly complicated for the objective of the tutorial…..can you ppl not just create a simple json parsing tutorial thats uses afnetworking and a tableview like everyone on the damn internet wants or is there some damn conspiracy on the internet amongst developers making actually relevant and practical tuts to protect their salary’s? Haha, this is mean, but I would have to agree. I found the described class hierarchy very useful to structure my app. Maybe it was overly complicated for you personally? Please provide code to modify the groupsFromJSon method within the GroupBuilder class access other data that like photo_link, or short name. Can you explain how to parse this data that is more deeply nested within the results dictionary? It appears that a great deal of the keyValues are part of NSArrays with data that isn’t accessible at the top level of results. This is is a phenomenal tutorial. Keep up the great work. Actually, I solved this by adding an NSArray to the Group.h file and then referenced it in the tableView of MasterViewController.m using valueForKey. Example: [group.category valueForKey:@”shortname”]). This returns the shortname of the category that is an NSArray that was added to the Group object. Is this tutorial supposed to display the detail/2nd view when you click on a meetup? It starts out with a master/detail application template, but my project doesn’t present a detail page when you click on a meetup/table cell from the root view. How the methods declared in MeetupCommunicatorDelegate can be called in the MeetupManager class if this class is not declared as the delegate of the class MeetupCommunicator? Really need another try to read this tutorial. Well I like this tutorial very much. I don’t think it is ridiculously overly complicated, instead, I am very much value on the concept of Communicator / Manager / Delegate. As it is a way to have good design of application. I am not good at application design and I start learning something like this, using Manager class to manage and work with custom built delegate. I look forward to see if you can provide another extend of this tutorial to show: when there is not only a single view controller, and different type of API call is performed in different view controller, do we still use single Manager class? or call the same Manager in different View controller? 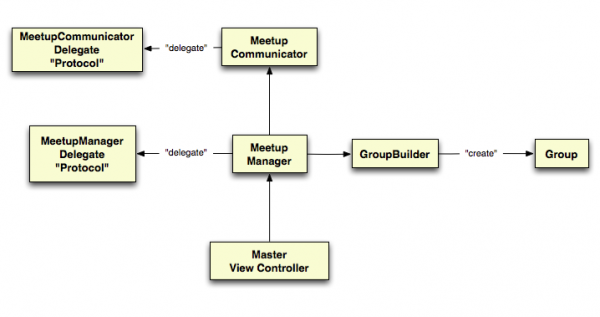 If there are many viewcontrollers to communicate Meetup, all of them should have meetup manager variables? Moreover all of them should be delegate of meetup manager? thanks for this tutorial, I have a question, can I work with this tutorial under Xcode 5 and iOS 7 ?! Yes, this works with Xcode 5 and iOS 7. I have followed the tutorial successfully. What’s with the parameter type (NSData*)? I see it gets passed around but what is it exactly? The object “objectNotation” is an NSData type, where does the “objectNotation” parameter get set? Like Chuck Kelly I thought AT FIRST that this approach was overly complicated. After I tried a simpler tutorial that didn’t work, I came back, adapted my app to this approach and it worked Perfectly!! Most of the tutorials only give part of the information you really need, or are so simple, it’s hard to expand the concept into a practical implementation. This is one of the few sets of tutorials that are actually well written and provide useful, real-world-like examples. Thank you! I might have missed it, but aren’t you supposed to tell MeetupCommunicator, that MeetupManager implements MeetupCommunicatorDelegate? I mean, how does [self.delegate receivedGroupsJSON:data]; in MeetupCommunicator know to call (void)receivedGroupsJSON:(NSData *)objectNotation in Meetupmanager? There should be something like self.communicator.delegate = self; somewhere in MeetupManager implementation, right? This was a very great tutorial, and I learned a lot from it. I just have one question though, is it possible to parse multiple apis using the same code above. If so, how is it possible? I tried adding 1 page view controller between navigation controler and table view. but after that the list does not display data from a web service. can anyone help me? Can you help me please? Your tutorial is nearly exactly what I need to do for my own app, so it would help me a lot to perform the entire tutorial. I have a problem using iOS 8, when I use iOS 7.1, this tutorial execute ok, I used emulator iOS 7.1 and device (iPhone 5s) using iOS 7.1, but when I use iOS 8 (emulator or device), dont display anything. There is not error message, and the json don’t return lines. What’s changed in iOS 8? Maybe localization ? I’ve run into the same problem. http://stackoverflow.com/questions/24062509/ios-8-location-services-not-working. And also I had to remove ‘description’ key to run this example. Great tutorial. I got it working for everything except the description property. Xcode says auto synthesis won’t work for read/write so makes it read only. This causes crashes when I try adding the JSON data for description. Any suggestions? The reason: ‘description’ is a property of NSObject. Not fully synthesizing it results in an exception. This provides a hint to the user as to why they’re staring at a blank screen. If you’re running this on the simulator, go Home, then Settings, then Privacy, Location, BrowserMeetup and select ‘Always.’ Check that Location Services is also enabled. You’ll have to enable Location Services access each time you build. Couldn’t you just show us how to serialize/deserialize JSON? Why create an entire app with a bunch of other important concepts that are completely unrelated to your post? How to use oauth for any services in ios ? can you do this tutorial with swift language ? 3. Warning: “BrowseMeeting” is a project downloaded from the internet. Are you sure you want to open it? Open. 4. 27 Warnings exist at this point. Go to the Warnings and select the first one – Validate Project Settings – Update to recommended settings – then Perform Changes/Continue. 5. 26 Warnings exist. These are related to source control; All the files need to be committed and then a Refresh Status run. This can be done later. For now, leave it. 6. Run the app: Blank Browse Meetup table. Not good. 7. Stop the app, 29 Warnings now. 11. Run the app: Same results. Stop the app. Now back to 26 Warnings. Better. 12. iOS 8 introduced a change to kCLAuthorizationStatusAuthorized. kCLAuthorizationStatusAuthorized became kCLAuthorizationStatusAuthorizedAlways and kCLAuthorizationStatusAuthorizedWhenInUse. As such, in Settings/Privacy/Location Services, you will need to first make the setting be ‘Never’ (because there is no other choice), then go back and change it to Always or While Using The App. 14. 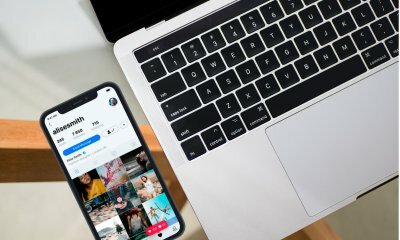 Stop the app, go back to Settings/Privacy/Location Services – your settings for BrowseMeetup have been wiped out, or will be if you try to run the app again. This is terrible! 18. 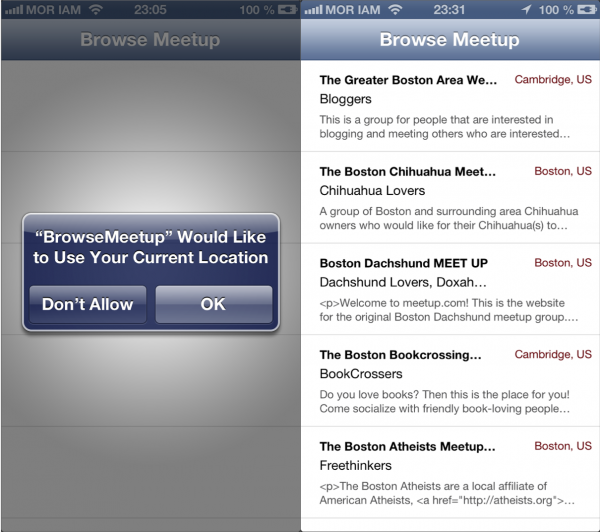 Run the app… Popup – Allow “BrowseMeetup” to access your location even when you are not using the app? Always Description Click Allow – blank screen, but if you drag the table cells, you’ll see it populates. Stop the app. 19. Go back to Settings/Privacy/Location Services and change the setting for BrowseMeetup, then go back to the app, then exit the app – the settings stayed. Very good. Easily we can fetch Jason using iOS SDK, very informative tutorial. Thanks for sharing with us. your link to download was removed.. Thank you for sharing the great article for me to learn ios programming language.